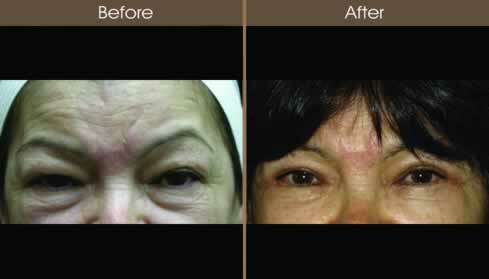 64-year-old female concerned with aged, puffy appearance of her eyes underwent an upper eyelid lift (upper blepharoplasty) and lower eyelid lift (lower blepharoplasty). She felt that she looked older and more tired as a result of this. The procedure involved an upper eyelid lift with obicularis muscle resection in conjunction with fat reduction and repositioning. Her lower eyelid lift involved a septal reset with fat preservation to ensure that the results not only look outstanding today but also ten years from now.